•Newly designed ventilated nosepiece is soft and adjustable, allowing heat to dissipate from nose bridge and reduce fogging. •Perfectly balanced from temple tips to the bridge of the nose, providing the best fit possible. •High quality optics offer extreme clarity and no distortion. •SOft dual-injected rubber temple tips combined with fully adjustable straight back temples reinforce the highest level of comfort and fit. •Top of frame is ventilated allowing air to circulate and prevent fogging. 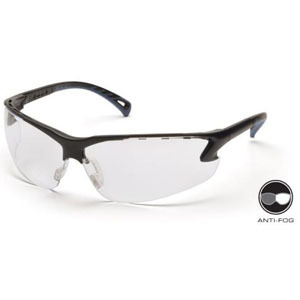 •9.75 base curved lens provides excellent side protection against wind and airborne particles.